The Currents class meets on Sunday at 9:45 am for coffee followed by the lesson at 10 am. The material currently being used is Cokesbury Adult Bible Studies and the teacher is Aaron Moody. Our back-up teacher is Mary Jackson. The class is open to all ages so come and join us! The Currents Class meets in the classroom at the southwest corner of the Education building, on the main floor, across from the Fellowship Hall and next to the Library. The St. Andrew Class was organized in September 1954 and is a group that includes both singles and couples and retired and working individuals. This class is great for those who enjoy fellowship and regular emphasis on important matters through a biblical perspective. The St. Andrew Class regularly supports the Women’s Shelter and most of its members are active in other mission ministries of our congregation. The class has two outside retreats and a Christmas party each year. The St. Andrew Class meets at 9:45 am Sunday mornings and starts with refreshments, singing, and a devotional time. They meet in Room 318 on the upper floor of the Education Building and follow the Adult Bible Study Series. Please see our Children's Ministry page for details about our Sunday School class for children. WHEN: Every Tuesday at 7 pm. WHERE: Online at: To Be Announced. SIGN UP: Please contact us at grow@atlantafirstumc.org to sign up for the class. Let's grow together in an online small group study on Tuesday evenings at 7 pm. 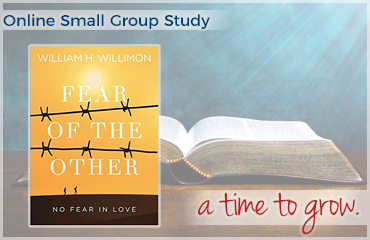 The study is led by Pastor Jonathan Brown, and will focus on the book Fear of the Other by William H. Willimon. WHEN: Every Sunday at 9:45 am. 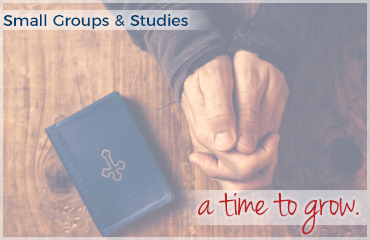 Let’s grow together in our faith with small group studies! 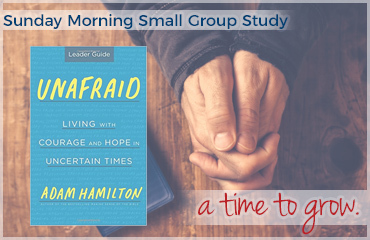 Sunday mornings at 9:45 am, Assistant Pastor Jonathan Brown leads an 8-week study covering the book Unafraid: Living with Courage and Hope in Uncertain Times by Adam Hamilton. Books available to purchase at the church for $20.